What type of experience does a security guard need in order to obtain a license? Security Guard Licenses often have experience and education requirements. The specifics vary from by jurisdiction. Sometimes either education or experience can be used to meet the threshold. Experience must often be documented by affidavits from a former employer or W2 proof of employment documentation. For education requirements, applicants must show certification or a diploma for the classes completed. Often specific state approved/issued training course must be attended by the applicant. See below for examples of experience and education requirements for Security Guard Licenses. In Tennessee, no prior experience is required; however applicants must complete a 4 hour training course and pass an exam based on the course. 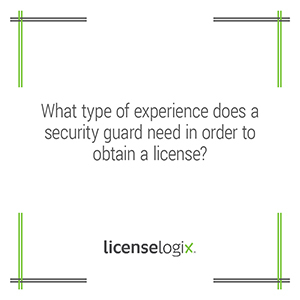 LicenseLogix will help individuals determine if they have the proper experience and training to obtain a security guard license. We provide comprehensive research regarding your licensing requirements, and we prepare error-free application packets, minimizing time-consuming and costly delays. For additional help you can fill in the form on the bottom or give us a call at (800) 292-0909.